the other day jas & i were in the neighborhood and decided to step into D.I. for some thrifting of course. 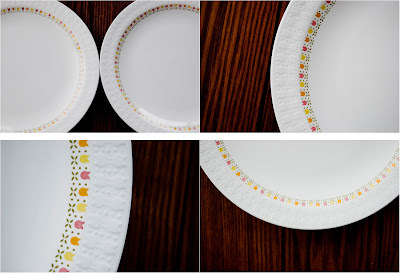 we found these adorable plates for way too cheap. Not to scare Jason, but I have a few shelves in my storage room full of dishes that were way too cheap to pass up at DI. It's a disease. BUT I totally agree with your purchase. They are adorable. Those dishes are way cute. Good purchase. Dishes that I think are scary at DI are the plastic ones that have gouges in them that could be full of something....not sure what. Those gouges may be from microwave cooking. Anyway, you did a good job.